First a bit of something fun! I would like to thank Jess and Lyns at All Things Cupcake who selected me as one of the Cupcake Talent Picks of the Week! All Things Cupcake features loads of beautiful cupcake pictures, as well as other awesome cupcake related items. Check it out, and thanks again for choosing my cupcake! Now, on to what you came here for … cupcakes! 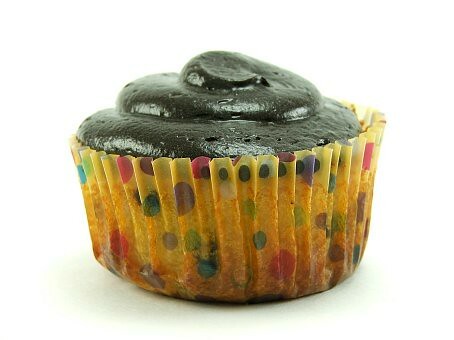 When I was growing up my mother would make chocolate chip cupcakes with chocolate frosting for me to take to school on my birthday. I have fond memories of this particular cupcake and since my birthday is just around the corner I thought I would go a little retro and make some. 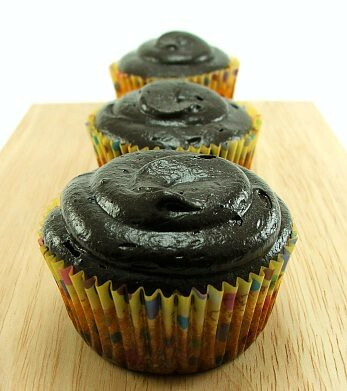 My mom always made these cupcakes from a mix, but I wanted to use a scratch recipe for my cakes. I had a recipe for yellow cake that I cut down, added some chocolate chips and scooped it into paper liners. I frosted them with a simple dutch chocolate buttercream and they took me back to elementary school, except without the peer pressure and teachers. 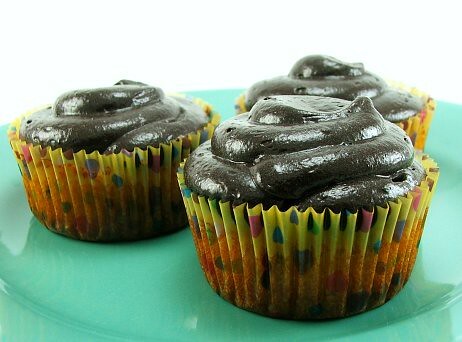 Make these cupcakes by hand, or by using your mixer sparingly. 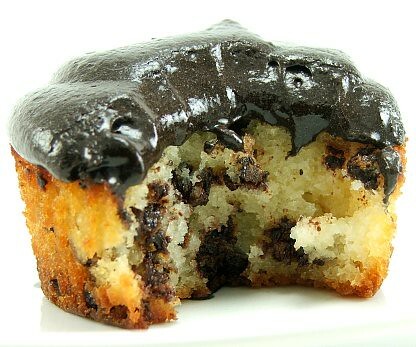 The more you mix the tougher these cupcakes will be. They require a light touch, but that is not a bad thing. What it boils down to is this requires very little work for a spectacular result. 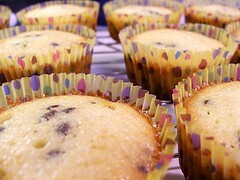 Heat your oven to 350 F and prepare the cupcake pan with paper liners. Allow the butter, eggs and buttermilk to come to room temperature. Cream the butter, sugar, golden syrup, and vanilla. Mix until just combined. Mix the eggs with the buttermilk, then in a separate bowl sift the dry ingredients. 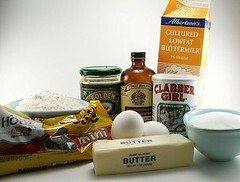 Add the buttermilk mixture alternately with the flour into the butter mixture. Do not over mix. Fold in the chips then scoop the batter into paper liners making sure the liner is no more than half full. Bake for 35 to 40 minutes, or until the centers spring back when pressed gently. Allow to for five minutes in the pan, then turn out into a wire rack to cool completely. Cream the butter and cocoa powder until smooth. Add the vanilla, powdered sugar and milk. Mix until smooth. If the frosting is too loose add more powdered sugar by the 1/4 cup until it reaches the desired consistency.